The factors that impact search results have changed drastically. The best search results are not just the ones which have the right content and meta-tags and relevant links pointing back to them. Hoteliers also need to focus on several ranking factors such as the ones that are related to your website, content, relevance of business in online world, social circle and online reviews, search categories saturation etc." Search is continuing to evolve. After the Panda update, the algorithm that previously worked well for SEO – relevant content, right meta-tags, and relevant in-bound links are not enough for high rankings on search engines. While these factors continue to be extremely important, there are several other new ones, too, that have also come into play. Before we delve deeper into what impacts search rankings, here’s a view of what has changed in online channels in the last 10 years. In 2001, the main online channels consisted of Paid Search and Organic Search. Fast-forward to 2011, the main online channels include: Paid and Organic Search of course, Local Search, Images, Videos, Maps, News, and Social Media. Google’s intent is to present the best result to the consumer that is relevant to their query. 2011 Ranking factors just released by Danny Sullivan, include several key on-page and off-page factors such as freshness of content, site architecture, social relevancy, authoritative links etc. This is where social relevancy comes into play in a big way. Google’s initiative on Google +1 is exactly targeted in that direction. Now Google is integrating your friends’ (social circle) likes and recommendations with the search engine algorithmic results. Google is also placing significant emphasis on the reviews that the business has. Another important thing that is factoring in Google’s search results is the consumer’s personal preferences. What may be the best results for one person could be entirely different from that of another person based on personal preferences, friends in the social circle, and the location. As you will see below, the search results for a simple query – San Francisco Hotels, are different when the user is logged into their gmail account or if the user changes the location where the user is based. So, what does all this mean for the hoteliers? Here are some simple conclusions that the hotels can draw from the recent changes. e. Search categories saturation – local, paid, videos, images, news, blogs, etc. Content continues to be the most important ranking factor. It is important for hotels to have good quality, original content on the website. Syndicated content, while useful for conversion, will not have much impact on search engine rankings. Hoteliers need to change their focus from ranks in search results to things that are more meaningful – traffic, conversions, time spent on website, bounce rate, revenue. The rankings for keywords will vary depending on the user preferences, user’s social circle, and user’s location and cannot be used to judge the success of a SEO campaign. Social relevancy will continue to strongly influence search rankings. Likes and dislikes of people in your social circle will impact the search results. The reviews for the businesses will have a significant impact on the rankings. While hotels should continue to encourage reviews on channels such as TripAdvisor, it is important also to add Google Places reviews channel to the list of sites that hotels are focusing on. Google Places reviews will impact the placement of the business in search results, especially on local search channels. 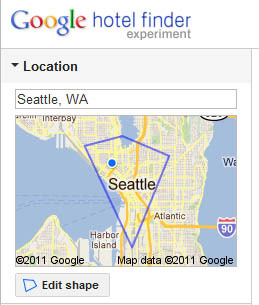 Google Hotel Finder helps sort any hotel based on people reviews, rating etc. While Search Engine Optimization (SEO) continues to be a significant strategy with high return, a successful online marketing strategy needs to have other key marketing components such as SEM (paid search), social media optimization, online reputation management, and ways to generate authoritative trusted links. In summary, search engine marketing is changing rapidly as social media continues to grow in significance. Hotels should evolve their marketing strategies to keep up with the changing landscape. Cross-marketing across different search channels and social media channels will result in highest return on investment.